Dorel Home Products is committed to providing unique and functional furniture pieces at affordable prices. Give your little ones, growing kids, and those young teens the freedom and space to host friends or a sleeping solution for an older child and younger sibling with this Twin-Over-Full Bunk Bed from DHP. This modern, stylish bunk bed features a Twin top bunk over a Full bottom and looks great in any bedroom or guest room arrangement. Two integrated side ladders come included to provide versatility and metal slats on the top and bottom beds offer the right amount of support, comfort, and durability. Besides the sleek, space-saving design, it’s also amazingly simple to assemble and comes in one convenient box. The top bunk accommodates one standard twin size mattress (maximum thickness of six inches) and the bottom bunk will hold one standard full size mattress. 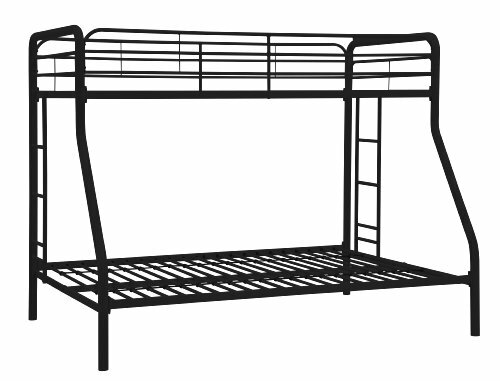 The top bunk has a weight limit of 200 pounds and the bottom bunk will support 450 pounds.